Taken with Olympus E500 digital camera March 14th 2008. Click image for larger view. 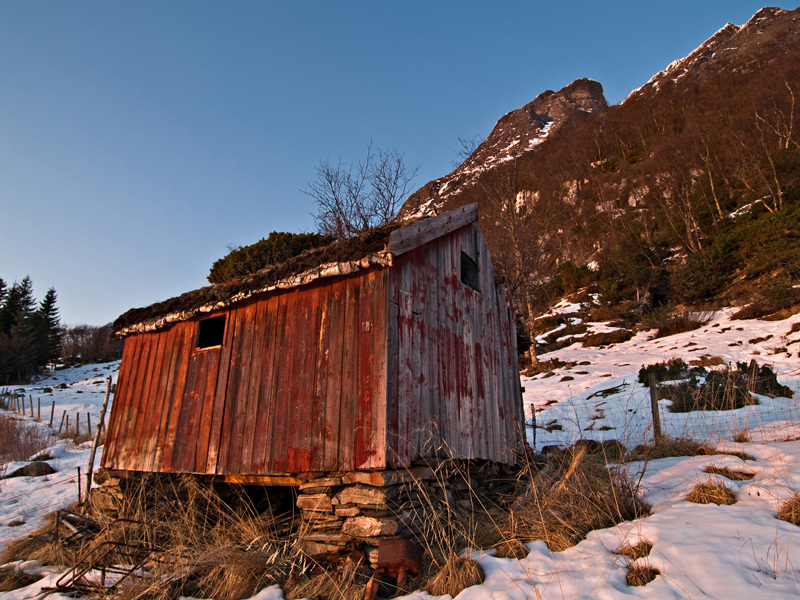 In this picture you can see a traditional, old Norwegian summer barn with some mountains as background. In older times these barns were used to house livestock during the summer season. The summer barns were often located a bit away from the farm land and closer to the forests and mountains where the livestock grazed. Notice the common juniper and small birch trees growing on the summer barn’s grass roof. It must be decades since it was last in use. The sun was about to set and so that explains the red color on the snow. If you want to take a look at other decaying buildings check out this and this picture. Spectacular shot. Being of Norwegian descent, I would really like to visit Norway one day. Looks frigid, though! Great photo, especially with the evening sun. Thanks for sharing it with us! Hello – this picture so reminds me of a holiday I had in Norway – one of the many treasured memories were the old stone buildings with grass growing on the rooftops . . . such a lovely place.